Every payslip is automatically registered as a communication transaction and therefore traceable at any point of time. The confidentiality needed is created automatically by encryption. Only the sender and the correct recipient of a regipay message can open the message. To secure the integrity of the payslip, the digital fingerprint of the payslip is sent to the regify clearing service together with the key. An e-mail with the encrypted payslip as an attachment is automatically sent from the employer to the employee. The private e-mail addresses of the employees are used. The employee opens the attachment with a double click (like a PDF document). In the background, the regify software takes care of the authentication of the employee by the provider, so that the key can be received, which immediately allows the attachment to open. Using the key, the attachment is decrypted and the employee gets access to the decrypted content of the message (payslip). With the help of a special user interface the employee can open, save or print the payslip. The regipay process makes sure that the message can only be opened if the sender has been properly authenticated and thus prevents the sending of messages by non-authenticated users. The opening of the message (payslip) is confirmed to the employer by a confirmation receipt. "Our commitment to continual further development led us to the idea of digitalising the sending of payslips. The savings are already evident in the initial implementation phase. We plan to continue with the changeover promptly." Heiko Abbenseth, Head of Business Management and Processes. Automated process in which the regipay desktop prepares the payslips, and then the user registers them and sends them with just one click. Supports dual channel: electronic and print. 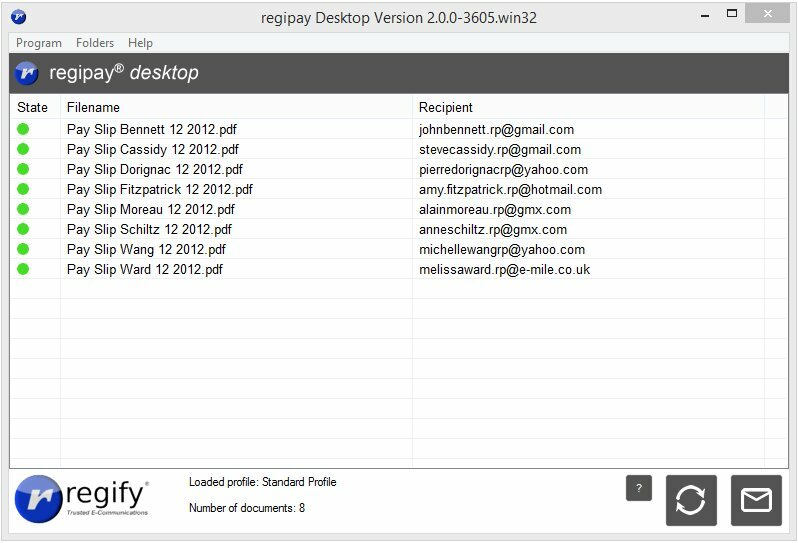 The regify client is available for Windows, Mac, Linux and mobile devices with Android and iOS (iPhone, iPad). Alternatively, the salary document can also be opened via a web interface. No installation is necessary. 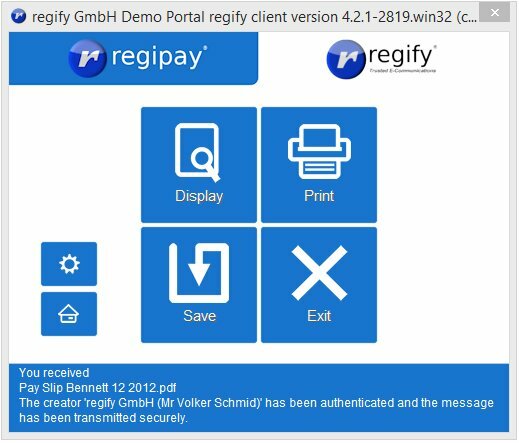 The regipay user interface allows a quick and easy application of the main functions: View, print and save without any need for training. You can choose how you send a payslip individually -depending on the employee need- either electronically by regipay or as a paper document. You can see this choice on the screenshot below. For free trial, please contact us here.